We are still 51 days away until kickoff to the 2015 Gamecock football season. Those fifty days might as well be ten days as the excitement and buzz has started to gain some momentum. We just finished a 24 hour takeover on the SEC Network and our DVR's are now 90% full again and now SEC Media Days has officially begun. This usually marks a time when fans start to feel that college football atmosphere back in the air again. Well, minus the weather of course. An offseason sifting through all of the preseason predictions, hype videos and stories from the weight room has now taken its toll. Now, we get to hear from the coaches on how the players are progressing and what the season may look like from their eyes. We get to hear directly from the players on what they love most about football and other hard hitting questions. We get some humorous and controversial quotes, interviews and plenty of photos. Lots of photos. But, often a coach will drop the name of a player that has stood out during the spring and so far this summer that could potentially have a big year. That player this year in my eyes is Deebo Samuel. Deebo Samuel played his high school career at Chapman High School just outside of Spartanburg, SC in the big city of Inman. His stats were school record breaking during his time there, 166 receptions, 53 touchdowns and over 2700 yards. Oh and by the way, he also ran the ball out of the backfield 133 times for 900 yards and 13 touchdowns. I asked his head coach at Chapman, Mark Hodge, what Gamecock fans are getting with Deebo Samuel. “Athletically, he has the ability to be one of the best to ever play at USC.” Hodge said. The redshirt freshman has already garnered the attention of his coaches and a lot of Gamecock fans. Deebo will likely start the season at WR, as noted in the newly released preseason depth chart, but will probably see the field in a number of different positions. He now has a year under his belt learning from the sidelines, studying the playbook and working with the scout team and is ready to see some playing time. Samuel is an extremely versatile athlete with natural talents very similar to Pharoh Cooper, Ace Sanders & Bruce Ellington. I feel like Spurrier Jr. will find a lot of different ways to get the ball in his hands this season, similar to how they were able to use Cooper last year. The opposing defenses will certainly be keying in on Cooper as part of their game plan, and that should open up some holes in the passing game for Deebo to exploit. I expect to see a lot out of him in special teams as well. The Gamecocks finished the season ranked 7th in the SEC in total kickoff return yards but dead last in average yards and could use a lot of improvement. Samuel has the strength and speed to get the job done in the return game and could help the Gamecocks in critical starting field position. We all remember how Ace Sanders came on strong as a kick returner. I feel the same way about Samuel. With the depleted receiving corps, this Gamecock team is eager for someone to step up on offense and relieve some of the pressure off of Pharoh Cooper. Deebo has been putting in the work, has all of the athletic ability and now has an opportunity to be a big playmaker and become a key part of this offense this year. 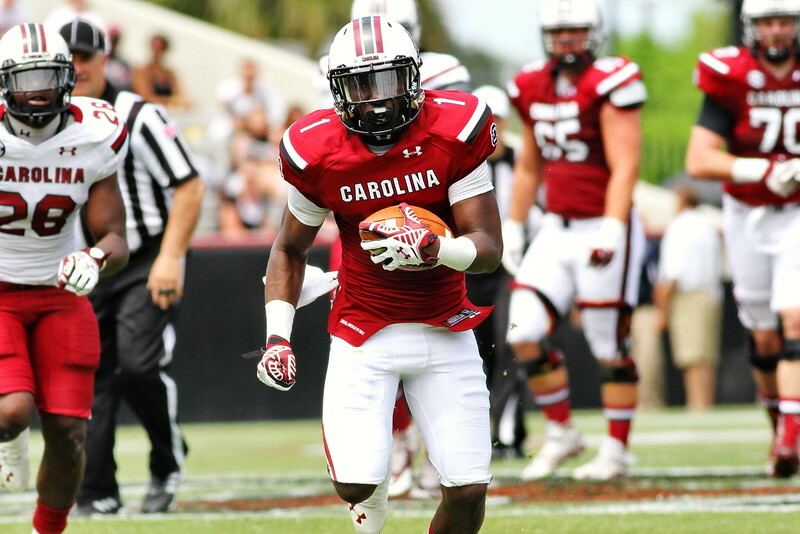 Deebo Samuel will have a big year and will be a household name to every Gamecock fan by the end of the season.